Back in May, I wrote a post about the restoration of the Schofield Building. The terra-cotta-faced skyscraper had long been covered by a steel and glass facade. The current owners are in the process of restoring the exterior. Unfortunately, at the time, I was unable to provide a good image of what the building used to look like. 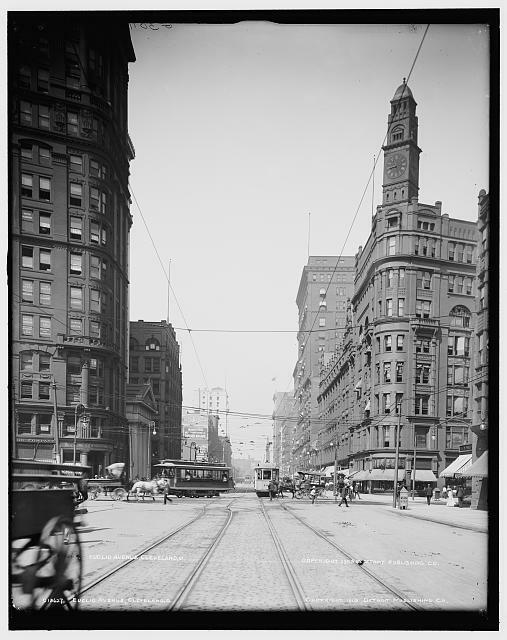 A few days ago, I came across this image, a photograph of Euclid Avenue made on an 8x10 glass plate negative, from the Detroit Publishing Company Photograph Collection in the Library of Congress. 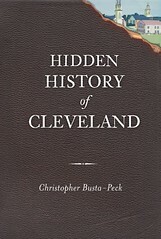 The Schofield building is seen to the far left in this photograph. The Library of Congress has been kind enough to scan the negative at ultra-high resolution, so if you want to see more detail, click through to their website for the really detailed version. Whoever thought it would be a good idea to cover this beautiful building with the ugly facade that hid it for decades should have their effigy burned in Public Square. I hope that the restoration project will try to restore the original masonry work as much as possible. I've been following the UrbanOhio forum devoted to this building. It all looks quite great except, as far as I know, there are absolutely no plans to rebuild the corner tower. It really offered a balance or sorts and brought out the true Victorian image. Wonder if some thing can be done about that. Maybe not quite as important as bringing back the original Richardsonian arch to The Arcade's Euclid facade, but almost as important. 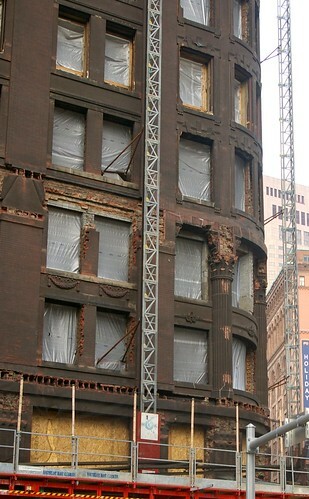 Tom - there are plenty of buildings that suffered this fate in downtown Cleveland (and in many other cities, too). Ken - I suspect that the cost of rebuilding the tower would be quite significant. While it would be nice to rebuild it, it's not like it's destroying anything right now by not rebuilding it. As for the Arcade, if I wanted to do something to fix its historic look, the removal of the totally inappropriate Hyatt awning would be the first thing on my list. How it got past the Landmarks commission, I'll never know. Great pic. Like the Hickock Building across the street also.